SEO (Search engine optimization) is the technique(s) in which online businesses use to increase website traffic. However, it shouldn’t be mixed up with marketing. Instead, you can think of SEO as a type of Internet marketing that should be involved in any company’s marketing strategy. With race as fierce as it is today, SEO is now more essential than it ever was. Having a powerful SEO strategy is important for any business that has an online presence. Once people use search engines, they’re more probable to choose results that appear within the top 5 suggestions on Google, Bing, or whichever search engine they select to use. An powerful SEO strategy will make sure a business appears in that list. SEO is also very good for social media promotion too. Those who find a company’s website via search engines such as Google or Yahoo are more likely to share it via social media channels such as Facebook, LinkedIn or Twitter—and who’s going to say no to a bit of free marketing? ​Keyword optimization: Choosing the best keywords to use for your SEO marketing plan is important. However, it does require careful observing to confirm the most effective words are being used and to uncover new keyword opportunities too. Having a powerful keyword optimization tactic in place will enable the company to drive more traffic to the website, measure potential web traffic, and realize more about what their consumers want. ​Title optimization:Along with keyword optimization, this is possibly the most vital part of on-page SEO. The title tag must be small but descriptive enough to let visitors know what the company is all about. Because the title tag is indexed on search engines, it serves as a much more essential piece of the company’s SEO marketing plan than anything else. ​Alt text for images:Adding alt text to any images on the website is additional way of making use of keyword optimization. Search engines will choose the relevant keywords relating to the image and will help them know better the page’s content. ​Link optimization:Optimizing links on a website helps a search engine establish how pages relate to another one. Active internal links are a crucial part of securing a high-ranking in search engines. ​Web content:It’s vital that companies have useful, easy-to-find info on their website. They also need to ensure it’s frequently updated with proper keywords and phrases in order to maintain good search engine rankings. ​Social media marketing: Social media is vast and so are the opportunities for promotion via it. Almost everyone these days has some form of social media account, and effective social media marketing will raise traffic to the company’s website, hopefully increasing business as a result. Having a strong presence on social media platforms also makes the company look more attractive and makes it easier for consumers to find them. It’s also a technique of doing free publicity as users will often ‘like’ or ‘share’ something that they feel is worth exploring, potentially growing your rankings even further. ​Social bookmarking: This may not be pretty as popular nowadays as it was in the past, but it’s still a good technique to attract traffic to a website however. Social bookmarking includes listing links on a network in order to generate more traffic to their specific website. Then, anybody who has access to that network can search for links relating to the keyword they have. It’s a feature that’s similar to individual bookmarking but on a collective scale. ​Link building:Fundamentally this includes building external links to the company’s website and is undoubtedly the most popular and effective of all off page SEO methods. Having quality links will not only increase the quality of your business website, but it will rise the quantity of traffic coming to it as well. If you have solid information on your website that others are happy to remark, this is again like free promotion. If someone mentions your website on theirs it’s a method of telling search engines the web page has good information. 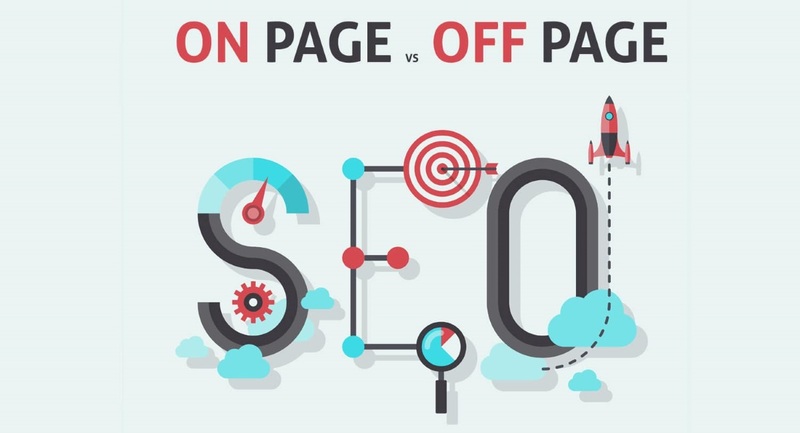 Hopefully, you will now have a learned a deeper knowledge as to what the difference between on-page and off-page SEO is and how it can help a business get more traffic to its business website. The most effective SEO plans are those that use a combination of both on-page and off-page planning. Promotion is an important part of any business strategy and the more platforms that are used in which to reach people, the higher the chance of victory.